A thermal source of water, which periodically ejects a pillar of hot water and steam to the height of up to 100 m. Frequency of explosions, may vary between several minutes to tens of hours. A geyser may fall dormant for many years or even die down completely. Geysers are present in areas of current, or young – as old as tertiary – volcanism and magma chambers. Magma chambers are sources of heat, which increases temperature of groundwater and volcanic gasses (carbon dioxide, methane) soluted in it. 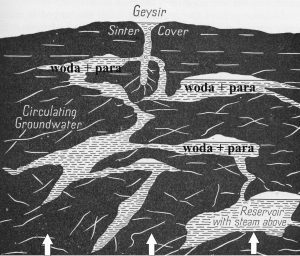 This water fills systems of cracks, channels and voids between rocks and grains and connect to the surface via a chimney of the geyser. When the solution’s temperature exceeds boiling point, sudden evaporation occurs and pressure of newly created steam causes an explosion – which forces water and steam to the surface. The resulting decrease in pressure and influx of new water from the system begins the calm phase. Next explosion occurs when the system reaches the boiling point again. 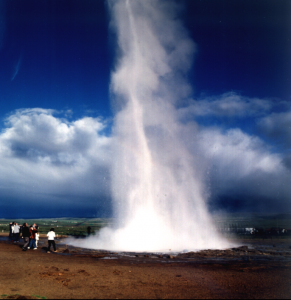 The name Geysers is originated in the Icelandic language and comes from Geysir, the largest geyser in Iceland, which in turn is related to the word gjósa – to gush, to erupt. The largest area of geyser presence in the world is Yellowstone, USA. 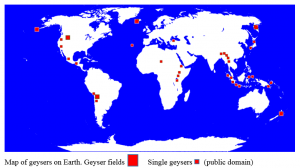 Moreover, geyser fields are found on Kamchatka, New Zealand, Andes and single geysers – in Peru, Bolivia, Mexico, Azores, Kenya and Japan. Scheme of a geyser: A system of channels and chambers is filled by groundwater. Heat influx from a magma chamber (white arrows) causes heating of water. Once boiling point is reached, the pressure of steam causes explosion and new water can fill the empty chambers again (Holmes 1956).